Personally, I love enjoying a potluck meal with my church family. 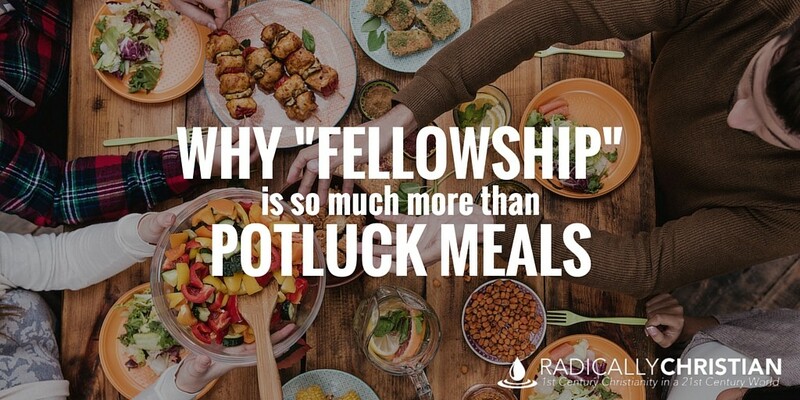 But unfortunately, many Christians so primarily associate the word “fellowship” with eating a meal that the two concepts have become virtually synonymous. In fact, it’s not uncommon to hear someone say, “I went to a church fellowship yesterday.” But did you know, biblically speaking, “fellowship” isn’t something you do or attend, it’s something you have? The Greek word for fellowship is “koinonia” (koi-no-NEE-ah). It was a word used to describe a very close and intimate relationship between two or more people. People were described as having “fellowship” when they had a business partnership, a very close friendship, a marriage, or were members of a community in which everyone shared their belongings with one another (source). Furthermore, all those who have fellowship with the Lord, have fellowship with one another. The gospel brings us all into communion, into family, into partnership, into association with one another. John said he and the other apostles were preaching the gospel, “So that you too may have fellowship with us; and indeed our fellowship is with the Father and with his Son Jesus Christ” (1 John 1:3). So it’s not entirely accurate to say we get together with our church family “to fellowship.” I think we need to stop thinking of fellowship as something we do, and start thinking of it as something we have. What Are the Indicators of True Fellowship? They spent time learning together. They sold their belongings when necessary to share with those in need. This is what “fellowship” looks like; it looks like togetherness. But many Christians do not experience true fellowship on a regular basis. They are content with a mere theoretical “fellowship.” They show up for a worship assembly and then slip out the back door. They don’t sit with their brethren discussing Scripture and its application in their lives. They don’t share intimate prayer time with their brethren. They don’t know the needs of their brethren, and they certainly don’t share their belongings to help with those needs. Can people see the fellowship you have with your church family? Jesus said, “By this all people will know that you are my disciples, if you have love for one another” (John 13:35). If there are no indicators of the fellowship we have with our brothers and sisters in Christ, how are people supposed to see our love? How Do We Strengthen Our Fellowship? A bond exists between two Christians because they are both Christians, but it may not be a strong bond. That bond – that “fellowship” – must intentionally be strengthened in order for it to be strong. But this is where the discussion gets difficult, because it depends on our mindset, our heart, our spirituality (see Colossians 3:1-4). While it’s certainly true that we must be together in order to strengthen our fellowship, merely being together does not strengthen our fellowship. When two Christians get together for a round of golf and simply talk about the weather and politics – but never discuss spiritual things – they may have strengthened their friendship, but they have probably not strengthened the bond (the fellowship) they have in Christ. Furthermore, an entire congregation could get together for a meal and not actually strengthen the fellowship they have in Christ. Celebrating the fellowship we have in Christ. Confessing our sins to one another. Singing psalms, hymns, and spiritual songs with one another. Sharing in the Lord’s Supper. Laboring with one another to spread the gospel and help those in need. Getting to know each others’ spiritual strengths and weaknesses. The leadership of a congregation can – and I believe “should” – facilitate and encourage the strengthening of fellowship, but it seems to me that only those of us who recognize the fellowship we have can be devoted to strengthening it. We must teach each other about the fellowship we have in Christ, how precious it is, and that it must be strengthened intentionally. This is why we must get together regularly for Bible studies, for worship, and even to simply sit around a meal table and visit about our lives in Christ. Fellowship will not be strengthened without ample time together, but we must be intentional. We must realize we are not getting together to fellowship, we are getting together because we are in fellowship.